In his 1959 lecture titled ‘There’s plenty of room at the bottom’, Richard Feynman envisioned the possibilities of manipulating and controlling things on a small scale. Today controlled manipulation of nanoscale objects, whose sizes are about a billionth of a metre, is a vast area of research. Manipulation of such nanoparticles requires trapping forces that can be focused and translated precisely. In a recent study, researchers from the Indian Institute of Science, Bengaluru, have designed a novel approach to trap and manoeuvre objects as small as 100 nm. A major problem faced with conventional trapping techniques is their inability to hold extremely small sized objects, also called cargo. Imagine picking up grains of salt using only a pair of needles! What makes it tough is that the force required to capture a particle reduces as it’s size decreases. So far, plasmonic tweezers -- nanosized tweezers made up of noble metals -- are used to trap such small sized cargo (think of a few molecules--that is the size we are talking about!). When illuminated by light, these tweezers create a strong electromagnetic field around themselves that can attract and trap nanoparticles that are close. However, plasmonic tweezers have a limitation. With a limited range of influence and being fixed in space, these tweezers can only capture nanoparticles in their vicinity; hence being inefficient. “So, it is necessary to design a technique that has the efficiency of a traditional plasmonic tweezer but, at the same time, is manoeuvrable”, says Souvik Ghosh, a researcher from IISc, and a co-author of this study. In this study, published in the journal Science Robotics, Mr. Ghosh, along with Prof. Ambarish Ghosh from Centre for Nanoscience and Engineering, IISc, have designed a new class of nanotweezers, that combines plasmonic tweezers with micro robots to design ‘mobile nanotweezers’ (MNTs) that bring together the best of both world. These nanotweezers can be driven to the target objects with precise control to capture, transport and release small sized cargo made of various materials with high speed and efficiency. "Microbots can carry/push objects very quickly, but do not work well for sub-micron objects. By combining the functions of these two technologies, we can not only trap but move very small objects very quickly" adds Mr. Ghosh. The design of these mobile nanotweezers is inspired by microorganisms. Akin to a bacterium that moves by rotating its helical flagellum -- a cellular protrusion used for swimming -- these ferromagnetic, helical nanostructures can be moved by a uniform, rotating magnetic field, which moves and rotates along the direction of the magnetic field. By controlling the magnetic field, the motion of the nanotweezers can be controlled. The researchers have designed two similar MNTs made of silicon dioxide. 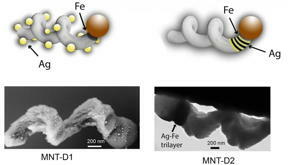 Silver and iron, combined with the nanostructures, provide plasmonic properties and magnetic properties. While the first design contains silver nanoparticles distributed across its surface, alternating layers of silver and iron are combined within the structure of the second. The researchers tested the two designs in a fluid chamber containing some cargo particles. They magnetically steered the nanotweezers towards the cargo and when the chamber was illuminated, they observed that the nanotweezer trapped the cargo which was subsequently maneuvered and released by decreasing the illumination intensity. “The first design works very well for particles that accumulate near hot places like silica particles, while the second is very general and does not care whether the particles like heat or not. For a general application, the second design is preferred”, says Mr. Ghosh. In addition, the researchers observed that when two particles of different sizes are present in the cargo, by decreasing the illumination, the smaller particle can be released, whereas increasing the frequency of the rotating magnetic field would release the larger particle. This unique sorting behaviour allows the transport of nanoparticles of different sizes by simply varying the two influences. The researchers also tested their devices beyond plastic and glass particles. They successfully trapped and transported Staphylococcus aureus bacteria and subsequently released it by turning the illumination off. Illumination intensities required by these nanotweezers are almost two orders lower than that can damage living bacteria. Also fluorescent nanodiamonds, an excellent candidate for quantum sensing, was maneuvered using the MNTs. “From being able to carry live bacteria to placing very small objects such as nanodiamonds and quantum dots at specific positions on a device, their applications could range from biomedicine to quantum technologies, sensor devices and many more”, Prof. A. Ghosh explains to Research Matters. Apart from carrying small objects to various spots of a microfluidic device, the researchers can also localize them with high spatial resolution and then take them away if necessary. “This should open up new avenues in nanoscale assembly that did not exist before" adds Prof. Ghosh. What comes next in this ‘small’ journey? “We are working on parallelizing the nanotweezers so that a collection of them can sort and assemble at nanoscale, just like a group of robots would work in an industrial assembly line. This will allow us to scale up our technology and will surely have tremendous commercial impact”, signs off Prof. Ghosh.